The militants six times breached the regime of silence in Donbas. Over the past day, the militants six times violated the ceasefire regime in Donbas. 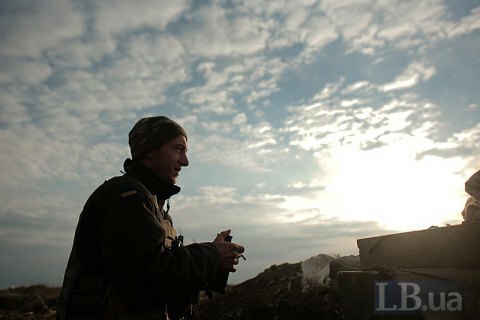 Amid the enemy shelling, two Ukrainian servicemen were slightly wounded, the ATO press center said in a Facebook release on Wednesday, 3 January. "The Russia-backed terrorist troops continue the shelling of the positions of the ATO forces in breach of the ceasefire agreements of the Tripartite Contact Group for the duration of the New Year and Christmas holidays," the report said. All of the ceasefire violations over the past day were in the Donetsk sector. In the Avdiyivka area, the militants used heavy machine guns and small arms, in the Verkhnyotoretske area – 82-mm mortars and infantry weapons. In the Azov coastal area terrorists fired 82-mm mortars, armored vehicles weapons, grenade launchers, machine guns and small arms at the Ukrainian defenders of Hnutove . In addition, the militants several times shelled the defensive fortifications of the ATO in Vodyane using the entire range of infantry weapons. It was quiet in other areas of the ATO zone. Earlier, the representative of Ukraine in the working subgroup on security issues of the Tripartite Contact Group, Yevhen Marchuk, said he was sceptical as regards the deployment of the UN peacekeeping contingent in Donbas in the nearest future.